StudentShare is a young, but already huge platform of the best essay samples generously provided by English-speaking students from all over the world. Each month we grow on 40+ subjects and 8K+ topics, as students keep coming and uploading their papers to our database. 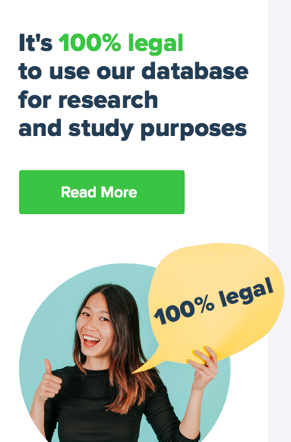 Using them for research and study purposes is not only 100% legal, but also reduces the time you spend on writing your paper! Nowadays it is hard to trust a service you didn’t try. Thus, we do provide you with the opportunity to try our service before purchasing it. Free essays are available for download for each user, and you can easily find them in a corresponding section of a Menu. We do offer a lot of help to our customers. We included a variety of Editing, Proofreading and Rewriting Services. Thus, each downloaded paper from our database can be rewritten under your requirements. So, you’ll get a unique paper, which would be way cheaper, than, f.e. ordering writing from scratch. Also, if you did write own work, but have hesitations about the grammar and spelling quality, you can order proofreading. Our brand new and unique feature. Each paper you download from our database can be hidden from other website users and be available only for your private usage. Thus, nobody except you will be able to access it. A place where each student is welcome to leave the toughest questions and await the answer from other students, professors, and our writers. Each hesitation and hardship will vanish! Helps everybody to get a precise and very accurate GPA rate. Also, it is completely FREE to use. There are tons, dozens, billions and millions of useful articles, covering practically every aspect of student’s life. No matter what you are looking for, fun, knowledge, science or help, you’ll find it all in our Blog posts. Did we mention it is FREE to use? The last, but not the least feature we have for you is our Writing Service. We are familiar with all the student's struggles, like lack of time, dull paper topics and so on. We know how hard it can sometimes be to write a paper you don’t want to complete. Why won’t you transfer this responsibility to someone, who’d love to complete it instead of you? We have top writers, who are specialists in a vast variety of fields. Thus, a topic that might be a nightmare for you is a delight to them. Student share review shows that ordering process is easy as ABC. Follow the link: https://order.studentshare.org/, leave your instructions, pay for your order and spend time doing more important things, than writing a paper. Your order would be completed in the shortest term, so forget about failing your deadlines. StudentShare is a helping hand for thousands of students all over the world. Our platform is designed in a way you can share your knowledge, ask questions, find relaxing and funny content and, most important, get the help you need badly. We know how to make working on your homework easy and fun. Download examples, order additional services or simply go through our blog posts. Each would be great for your studying. Each service is only as good as users say it is. Thus, check the reviews we got from our customers before coming up with a decision. this is a great idea! excellent and challenging!